Please refer to our stock # 11222 when inquiring. This wonderful vintage necklace was designed by 80's Dallas designer jewelers, Facets by Spectrum. The company's hand crafted pieces typically include antique European beads like the frosted glass dot beads in this piece. 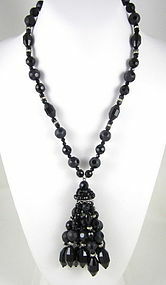 The tassel necklace is 28" long and has a 4" tassel at the center. The faceted oval beads at the bottom and on the neckpiece are acrylic while the others are crystal or glass. It has clear crystal rondelle accents giving this piece some extra sparkle. It is in excellent condition and easy to wear in any season.